Right below, you will find just that: everything that is new with a very short explanation by Apple itself. This information comes from Apple Support itself and at the source link at the bottom of this article, you can find the changelogs for earlier iOS versions as well, if you want to see when exactly Apple implemented a particular feature. 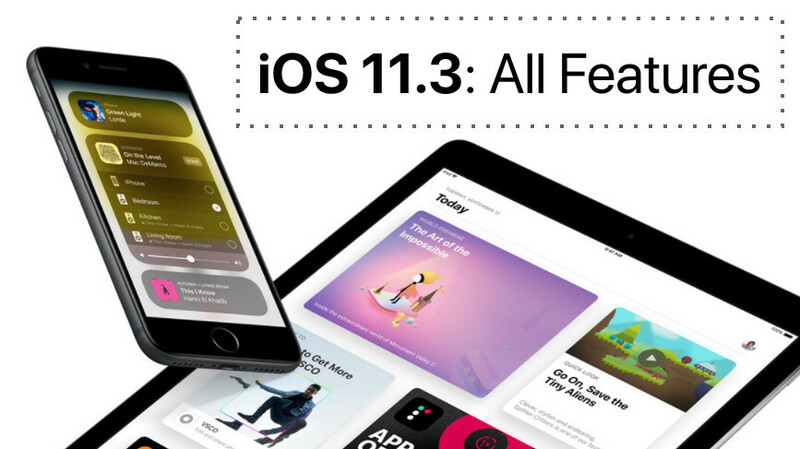 Have you already downloaded the iOS 11.3 update? When Google releases new Android, Pixel phones get it right away. You can't look at it that way. It would be the same way if Apple releases iOS to other manufacturers. It's easy when you have one device for years. Sad. That would only be the case if Apple let other manufactures put their own skin over it. Then it would be delayed as much as Android. Android should just stop letting people put skins over their android and give people the choice to use stock android or the manufactures one. Not so sure whats so sad about that, if fast updates was your main priority in a phone, then buy an iphone or pixel phone?If you just want a phone that works, then theres thousands of other choices? Who cares about updates if there's no improvements.. iOS is the same for years now. You didnt clearly read the changelogs, did you? --- Who cares? I care because software support plays a huge part on mobile OS. Like security and vulnerability patches. --- Users like you why some Android OEM takes time to update or not at all their devices, because apprently users dont see difference; updates doesnt mean visible aesthetic differences but also under the hood improvements (security fix, vulnerability patch, optimization, additional features,etc.). Just because its not obvious doesnt mean there are no changes. Obviously you never used iOS device. The changes in the OS are a lot. Yes, it looks the same, it has the same restrictions, but for the last 3-4 years the changes are too much. It is much improved. And i'm Android user. The problem with Google OS is the huge variety of OEMs, most of them don't care about providing updates. Also heavy customization as Samsung, with o many different phones making delivering the updates impossible. Apple have the better policy. Samsung is caring only about sales numbers. Thats why you have S, A, J, ... devices. To be honest, for me it's hard to spot a difference between iOS 9, 10 and 11. There is slower response of OS and multitasking that barely works, but other than that ... I use both platforms and the newer version on both rarely brings something really useful. I like Android updates more - newer versions = always better speed, better battery life, possible new codec support like LDAC and tons of stuff I or anyone else do not really care - like animations, stupid smilies, different launcher etc. If I would know how many bugs and issues are waiting for my iPad Pro, I would have never upgraded to iOS 11. Yep thats why i sold my S8 and bought an iphone X. I saw the fact my phone is going to obsolete very fast, or at least i’m going to have to wait a long,long time for updates. so what does stock android have that pretty much every android OEM already puts in their version? Updates can easily be done for all devices. If a small team of unoffical developers can provide unofficial updates and custom roms of the latest android OS for almost every android device out there, what makes you think the actual manufacturers are not capable of doing it? It is simple, the manufacturers are assholes that do not want to spend any money to help you keep your phone updated. They want to sell you their latest flagships. If they keep your phone outdated, the chances of you upgrading to the latest device is exponentially higher. Almost everything in this update can be done through play services updates and updates through the individual components apps if it were android. Those updates come frequently on android. Major os updates on android have been almost pointless for 3 years now. In iPhones the only way you get a new feature is via OS updates. In Android, no such problem. EG: MiUi 9.5 by Xiaomi was released for four year old devices AND the latest devices. Almost all features are on par. I am a big fan of stock Android but most custom skins also have excellent features which I wish Stock Android adopts as soon as possible. 11.3 is a must for ios users. I had beta version for a month and its great, my iphone X was noticably more responsive from day one. I’m using iPad mini 4 got update yesterday I thought the update will slow down the mini 4 since the hardware dated, but honestly mini 4 performanc imporved. This release is very snappy in terms of performance on my 7 Plus. The App Store downloads have drastically improved. The sad part for android users is that many devices are unlikely to even get Oreo. The happy part is that people running Lollipop and even Kitkat can do a lot more with their phones than iphones running IOS 11.3.